Sweet corn is at is best in September, if the weather is nice enough for a few final barbecues, you could include some sweet corn with chilli butter, although this fine cooked indoors on the grill too, you don't get quite such a smoky flavour. 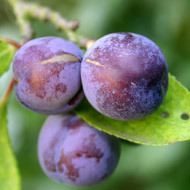 Damsons and other English plums are in season this month too. I feel very nostalgic abut damsons, since my family has a couple of trees that have been supplying us with them every year since my Dad was young! If you don't have them in your garden, try your local farmer's market or occasionally very good local green grocers stock them, but you're not likely to find them in a supermarket. There's a really easy recipe for Damson Cobbler in this month's Olive magazine which I'm looking forward to trying but they're great in crumble or Jam too. If you've no time just gently stew them with some sugar and them bag and freeze for ready made pie or crumble filling all winter. I even made damson gin one year when I wanted to make sloe gin and couldn't find any sloes! Parsley and Tomatoes are plentiful now and other vegetables include beetroot and garlic, as well as horseradish which I've only ever seen at the farmers' market.